Seventeen-year-old Annabeth blames herself for her mother's death. If only she hadn't snuck out to make out with her boyfriend. If only... While at the funeral of family friends, things aren't what they seem to be. Annoying Griffin has grown up to be more brooding and has a secret. Annabeth starts to realize that family friends who went on an expedition are dying. Could it be a curse or something more? 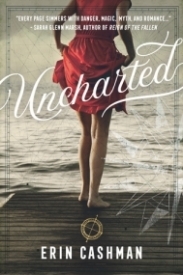 When her father goes missing, Annabeth sets out to investigate. What worked: Think Island of Doctor Moreau meets Irish mythology with a dash of Atlantis. This thriller has readers wondering what secrets are hidden at Bradford Manor. Fast-paced, I was able to read this in a couple days. There's action, suspense, hints at romance, a dark secret society, and Irish mythology. Annabeth is struggling with guilt after the death of her mother. She rather paint or escape in fantasy books. She comes across as strong and determined, especially after no one tells her what's really going on with the recent deaths and disappearances. Her determination to find out the truth puts her life and others around her at risk. Griffin is that brooding character who readers just know carries dark secrets. His secret has a lot to do with the disappearances and deaths of those around him. I liked the whole mythology twist and a mythic island that is like Atlantis, complete with an eternal fountain of youth. The author does a great job with details of this world. There's also two secret societies. One is ruthless is trying to find out more about the mythical island. While the other one makes sure the secrets don't get out. Either way, there is a huge cost involved. Thrilling ride on finding the truth of a mythical island and the quest to keep it secret.